Not that you should be shocked by this, since we broke news on it yesterday, but Google is now selling Nest Thermostats through Google Play for $249. For those new to the Nest, you are looking at a thermostat that couples beautiful design with the ability to learn from your life to help save you money and make temperature control something less painful than it ever has been before. It can be controlled via mobile and web apps remotely, learns from your daily schedule, will set itself to auto-away if it doesn’t sense your presence, sends you monthly energy consumption reports, and can be easily installed by you. It’s an awesome product, even at its $249 price. Be sure to read our Nest review from over a year ago if you haven’t already. 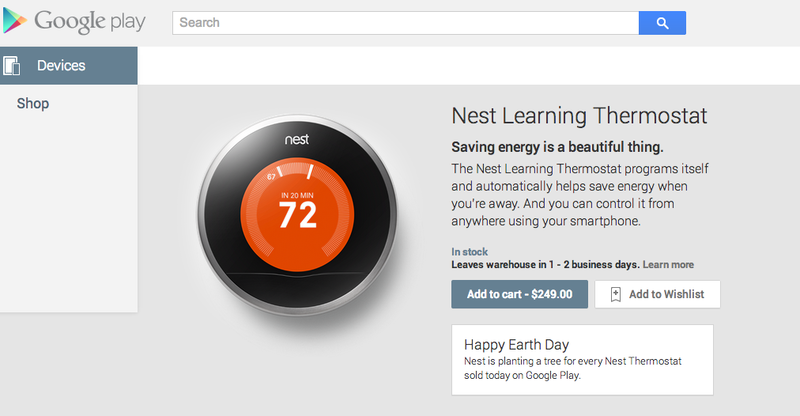 Also, Google is planting a tree for every Nest that is sold today.